do's and don'ts, all the different kinds of takeoffs, how to build them. How to make a mobile freeride jump watering system. We cover tools, techniques, rock jumps, specialty rock clearing tool, and places you wouldn't have thought to freeride build jumps. We also cover a technique for building a shovel takeoff and landing on level ground the most efficient way with the least effort and time possible! 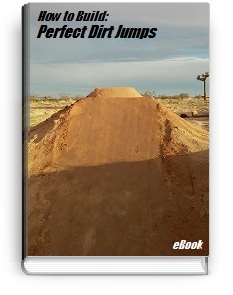 This ebook PDF will show you how to make correctly built shovel MX jumps and natural terrain freeride jumps. We go step by step through how to build takeoffs, watering, packing, radius, angles and landings. We go through all the types of jumps and whats good and bad about each one. I show you how to use a technique I have developed for using old carpet on jumps called "Five Tricks to Using Carpet on Takeoffs". 24 Page eBook, US & metric measurements is sent in a PDF file through e-mail within 24hrs. Set of 3 FMX ramp plans, 8'3'' (2.52m) Metal FMX Comp Ramp Plans, 8'4'' (2.54m) Plywood Sides skate style FMX Comp Ramp Plans and 8' (2.44m) Wood Stick Built FMX Ramp Plans. They are designed for a gap of 75' (23m). 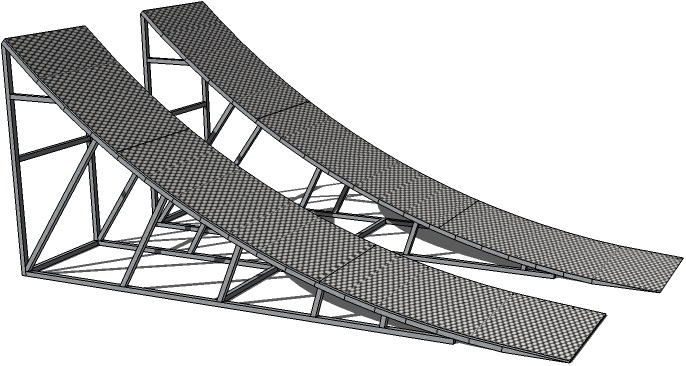 The metal/wood ramp designs are 'the standard' angle used in US FMX competitions while the stick built is 8m - 9m radius equivalent. These plan are both in US feet/inches and metric m/cm/mm measurements, are very detailed CAD designed scale drawing, full measurements, angles, instructions to make ramp angle/radius, "cut-bend-weld" (metal) method as well as radius instructions for having the rails bend, materials and cut list for every piece on the ramps, roll-in attachments and dirt landing plans for ramps. 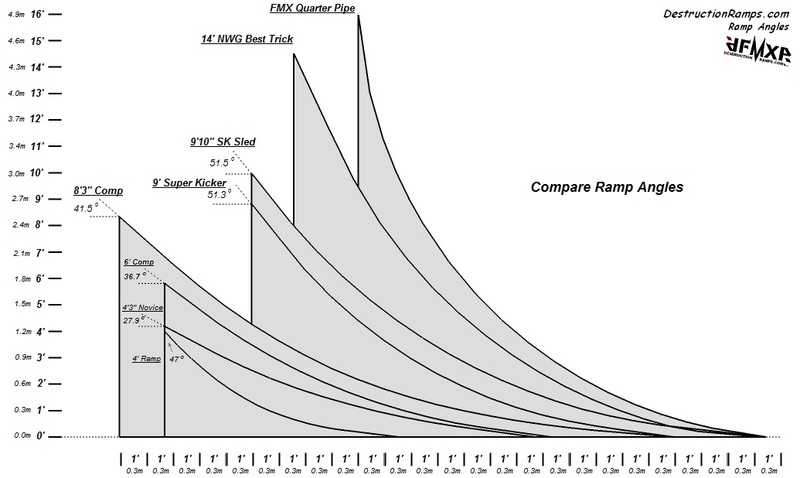 Set of 2 FMX ramp plans, 9' (2.74m) Metal Super Kicker FMX Ramp and 9' (2.74m) Wood Super Kicker FMX Ramp Plans. The ramp design is 'the standard' super kicker angle used in FMX competitions today. These plan are both in US feet/inches and metric m/cm/mm measurements, are very detailed CAD designed scale drawing, full measurements, angles, instructions to make ramp angle/radius, "cut-bend-weld" (metal) method as well as radius instructions for having the rails bend, materials and cut list for every piece on the ramps, roll-in attachments and dirt landing plans for ramps. These are plans for a 3rd gear FMX ramp designed for 120' (36.5m) gaps as used in Nitro World Games and pro FMX comps. 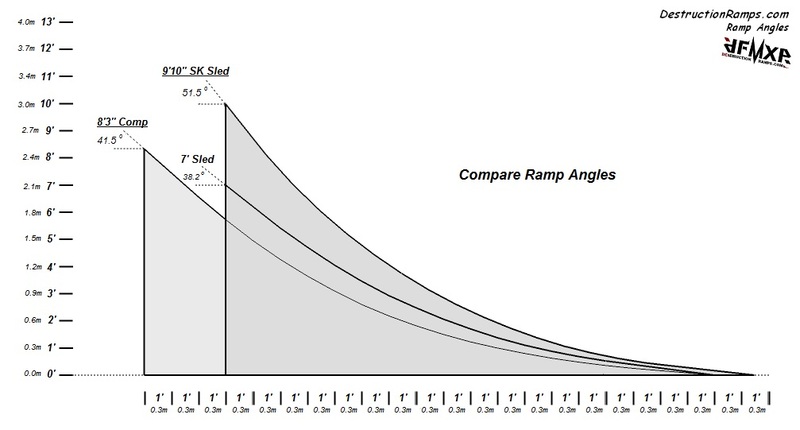 The ramp 120' ramp is a 13m radius design. These plan sets are both in US feet/inches and metric m mm measurements , are detailed CAD designed scale drawing, full measurements, angles, instructions to make ramp angle/radius, "cut-bend-weld" rail measurements, materials and cut list, as well as radius instructions for having the rails. Set of 3 FMX ramp plans, 6' Metal FMX Comp Ramp Plans, 6' Plywood Sides skate style FMX Comp Ramp Plans and 6' Wood Stick Built FMX Ramp Plans. These are designed for gaps of 40'-70' . Can be used with 450s, 250s, 125s, 80's, pit bikes or MTBs. 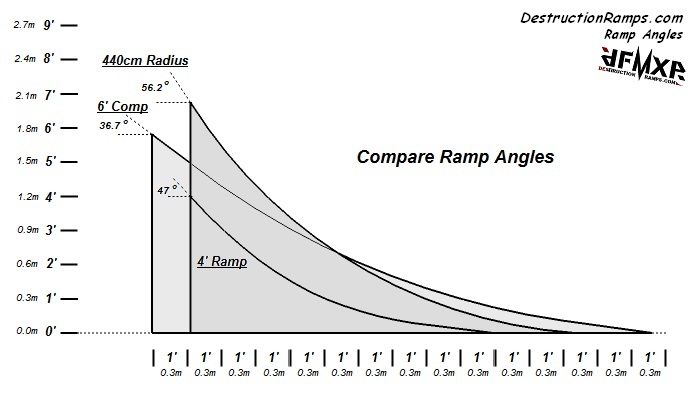 These plan are both in US feet/inches and metric m/cm/mm measurements, are very detailed CAD designed scale drawing, full measurements, angles, instructions to make ramp angle/radius, "cut-bend-weld" (metal) method as well as radius instructions for having the rails bend, materials and cut list for every piece on the ramps, roll-in attachments and dirt landing plans for ramps. 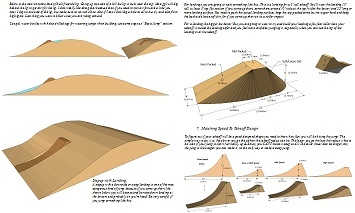 Set of 2 FMX ramp plans, 4'3'' Wood and Metal Novice FMX Ramp designed for gaps of 15' - 45' . Can be used with 450s, 250s, 125s, 80's, pit bikes or MTBs. Good for the novice that doesn't want to start out on a huge ramp but on a smaller FMX Ramp. These plan sets are both in US feet/inches and Metric measurements, are detailed CAD designed scale drawing, full measurements, angles, instructions to make ramp angle/radius, "cut-bend-weld" (metal) rail measurements, materials and cut list for every piece on the ramps, roll-in and dirt landing plans. Legal Disclaimer: This is an artist inspired rendering replica of the Nitro World Games Moto Best Trick ramp. This is not a copy. This is not the exact specifications or dimensions. We did not have contact with Nitro Circus, Nathan Wessel or anyone involved for any design information or dimensions of this ramp. We are in no way affiliated with Nitro World Games, Nitro Circus Entertainment or Nathan Wessel. We are in no way claiming this to be the exact ramp used in Nitro World Games, because it is not. This is ONLY an artist inspired rendering. These are plans for 8m Radius & Aussie / EU 9.1 meter consistent radius metal FMX ramps. Designed for a 22.86m gap. These plan are both in US feet/inches and metric m/cm/mm measurements, are very detailed CAD designed scale drawing, full measurements, angles, instructions to make ramp angle/radius, "cut-bend-weld" (metal) method as well as radius instructions for having the rails bend, materials and cut list for every piece on the ramps, roll-in attachments and dirt landing plans for ramps. *Note the 9.1m plans are metric measurements only. 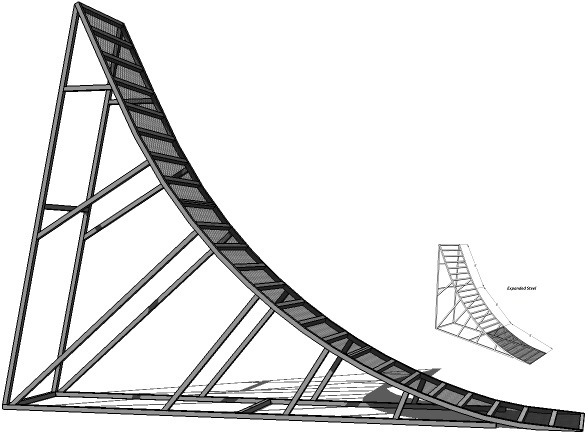 These are plans for a high air quarter pipe ramp as used in X-Games. Designed to come apart and bolt together in 6 parts so its movable in a truck or trailer. These plans are in US and metric measurements, are very detailed CAD designed scale drawing, full measurements, angles, instructions to make ramp angle/radius, "cut-bend-weld" rail measurements, as well as radius instructions for having the rails bend, materials and cut list for every piece on the ramps. Everything you need to know to build these ramps.